This, somehow, suggestivee image (approx. 5,5 Km - such as about 3,415 miles - across), taken by the NASA - MESSENGER Spacecraft on November, 21, 2014, attests to how the NASA - Orbiter is now able to (almost) perfectly resolve Mercury's Surface: in fact, with a resolution of a little more than 5 meters (such as about 16,4 feet) per pixel (---> picture element), a human being (---> one of us), just gifted with an "in the average" walking pace, could cross this whole scene in about one hour (maybe less). The picture shows the fine texture on the Inner Wall of an Unnamed Impact Basin of approx. 100 Km (such as about 62,1 miles) in diameter, situated immediately (---> very close) to the West of the larger Dali Basin. 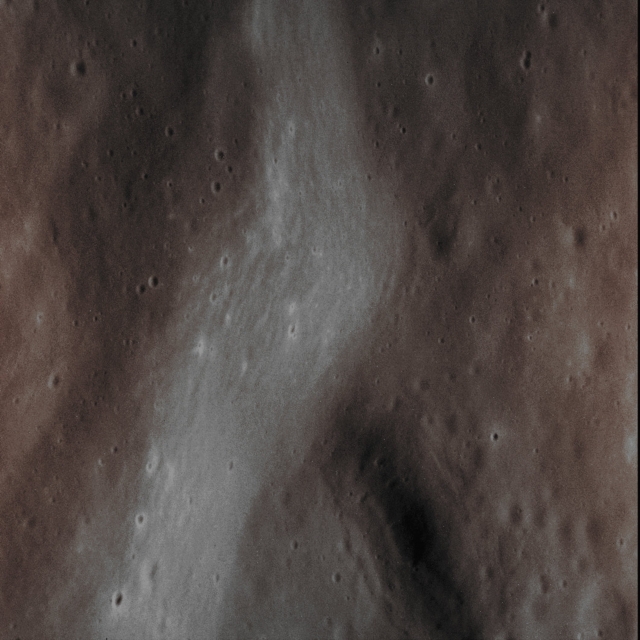 Both this specific Basin (---> very large Impact Structure) and its larger neighbor, are filled with smooth and flat Plains and they are highly deformed by Lobate Scarps and Wrinkle Ridges. p.s. : I deeply apologize to the Readers of our daily APOD, but I wish (and need) to remind you that I'm taking care of this Site all alone. This means that, sometimes, I can do my job in the early morning; some other times in the afternoon (or even the late afternoon), and, when the day (like today) has been very busy and heavy, late in the evening (now, just for your knowledge, it is almost 22:00 Central Europe Time - or "CET", for short). Sorry, but I do what I can. This picture (which is an Original NASA - MESSENGER Spacecraft's b/w and NON Map-Projected image published on the NASA - Planetary Photojournal with the ID n. PIA 19026) has been additionally processed, contrast enhanced, Gamma corrected, magnified to aid the visibility of the details and then colorized in Absolute Natural Colors (such as the colors that a human eye would actually perceive if someone were onboard the NASA - MESSENGER Spacecraft and then looked outside, towards the Surface of Mercury), by using an original technique created - and, in time, dramatically improved - by the Lunar Explorer Italia Team. Different colors, as well as different shades of the same color, mean, among other things, the existence of different Elements (Minerals) present on the Surface of Mercury, each having a different Albedo (---> Reflectivity) and Chemical Composition.